BAKLAVA – The Most Famous! Layers of buttery phyllo, loads of coarsely-ground walnuts, sugar, cinnamon and a honey-sugar syrup. Ground walnuts & spices, rolled within shredded phyllo and covered in a honey syrup. Difficult to make, dough is rolled very thin, turned as it’s fried & dipped in honey syrup. It’s topped with a dash of cinnamon & chopped walnuts. A cookie infused with orange juice, dipped in a honey syrup & topped with crushed walnuts and cinnamon. A light, melt-in-your-mouth butter cookie coated in super-fine powdered sugar. The traditional Greek Wedding cookie. A fluffy Greek torte made with ground & chopped walnuts that is flavored with and bathed in a sweet sugar syrup. A beautifully decorative almond cookie, topped with a sliced Maraschino cherry. A decadent cookie sandwiching a delicious apricot filling, topped with toasted sliced almonds. Two small cake-type cookies filled with pastry cream, dipped in a light syrup and coated with a chocolate glaze. As is traditional, this lightly sweetened, hand-twisted butter cookie has a delicate hint of vanilla with a light egg glaze. A staple in all Greek households, they’re fantastic when paired with tea or coffee from our Kafenio. 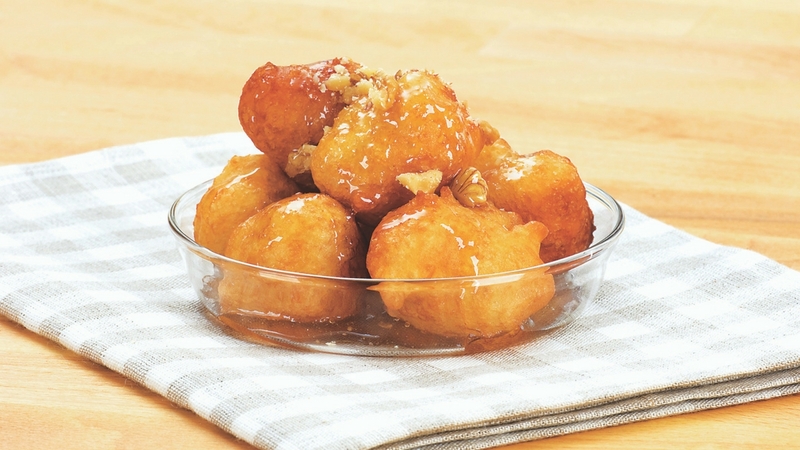 Baked by the Sisters of the Annunciation Monastery outside of Ocala, Florida, this fresh Greek Sweet Bread has been lovingly made by hand and topped with an egg glaze. Traditionally enjoyed in the Spring at Pascha (Easter) time. Perfect when toasted! Signature. Hailing from the family kitchen of Victoria’s Restaurant in Merritt Island, this sweet milk-custard pie is made with a layered phyllo pastry top & bottom, a creamed farina custard middle and is smothered with a simple syrup. Selections of our most popular Greek pastries in assorted & mono-packs. Filled with phyllo, walnuts, buttery cookies, cakes, etc. these make excellent gifts during any time of the year! From cheesecakes and napoleons, to chocolate and special desserts, these gourmet, small-batch baked goods are from local bakers, fresh-made in sweet, savory and even gluten-free! Only when available…so check often! Invented in 1957 Thessaloniki by Giannis Dritsas, this hallmarked foam covered blended iced coffee drink is made from Nescafe Greek Instant Coffee, frothed thick. A special demitasse-sized strong brew from the Greek brand Loumidis. Served with foam on top and the grounds at the bottom of the cup. Our own tasty brews using single-origin, locally hand-roasted Columbian coffee beans by CARMO. In light, medium and dark roasts. Ground fresh in the Kafenio during the day. Grab a bag of beans to take home! This marvelous black tea, blended with rose, jasmine and mandarin orange was created for the Oriental Hotel in Bangkok by the famous Parisian gourmet tea company Mariage Frères. Since 1854 they have produced special blends for the most astute tea lovers around the world. A custom ice cream made just for us! Starting with their delicious homemade vanilla ice cream, they’ve had a heavy hand mixing in chunks of our baklava. If you haven’t yet been to Here’s the Scoop, here’s your chance to try it! A signature of every festival, this deep-fried dough pastry is bathed in a warm honey syrup and sprinkled with cinnamon & grated nuts. Great on their own, or pair them with a scoop or two of baklava ice cream!